Pumps and valves for efficient processes. KSB has further expanded its product range for life sciences applications. Our established products for handling active ingredients and peripheral installations are now joined by a wide choice of pumps for high-end applications. As a system supplier, we can also draw on comprehensive know-how and offer economic all-in-one solutions from a single source. All pumps can be fitted with automation equipment and are ideally matched to the system they are installed in. Adjusting the speed to the actual demand during the production process helps to decrease energy consumption and, thus, lower the operating costs. KSB pumps for active ingredient handling are built to satisfy the highest demands on quality. 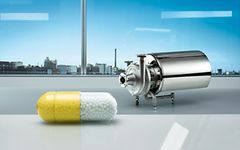 The comprehensive pump range of KSB offers complete and perfectly matched system solutions for the pharmaceutical industry.